This page contains pictures and information about Gum-treehoppers subfamily Eurymelinae that we found in the Brisbane area, Queensland, Australia. 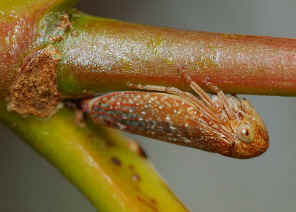 Once this group of Gum-treehopper species are classified as the family Eurymelidae. 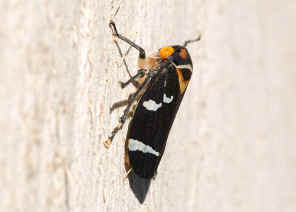 They are now classified as a subfamily of the Cicadellidae. 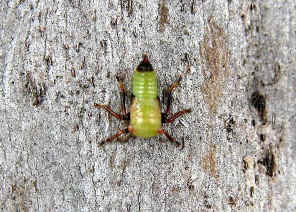 Most are found only on eucalypts and a few on Casuarina. They are confined to Australia and the near-by area. Many species in this family are brightly coloured or predominantly black. Their head is relatively wide and flat with ocelli in the front. 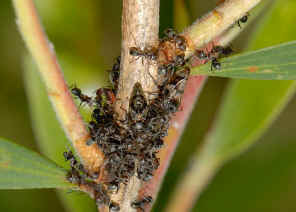 They often stay in groups feeding on young stems of eucalypt. Some species are solitary. 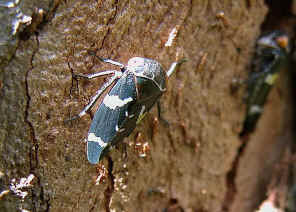 Nymph and adult feed by sucking the sap of the host tree. Sometimes there are the black moss around the treehoppers. This is an airborne fungal disease, sooty mould (Fumago vagans), which is often associated with the honeydew that the treehoppers excreted. 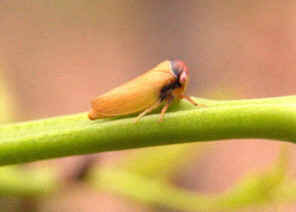 Unlike most other leafhopper nymphs, Eurymelinae nymphs do not jump. They avoid predators by running around the twig or branch. 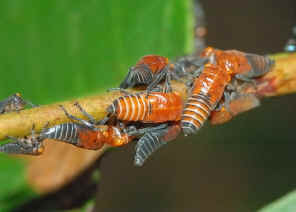 The nymphs always live in group. 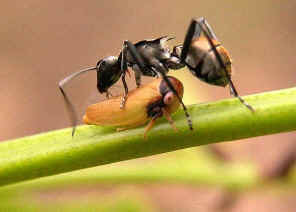 Both adults and nymphs are always attended by ants. 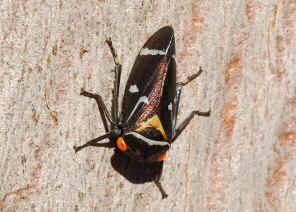 As most other bugs in Order Hemiptera, there are eggs, five nymph and one adult stages in their life cycle. Those ants around them are for their excretion of 'honey-dew', which is the excess sugar that the treehoppers do not need. 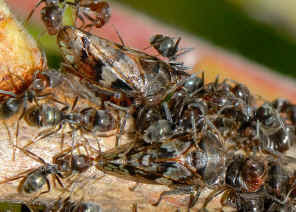 The presence of ants discourage predators, this becomes a kind of protection from the ants. 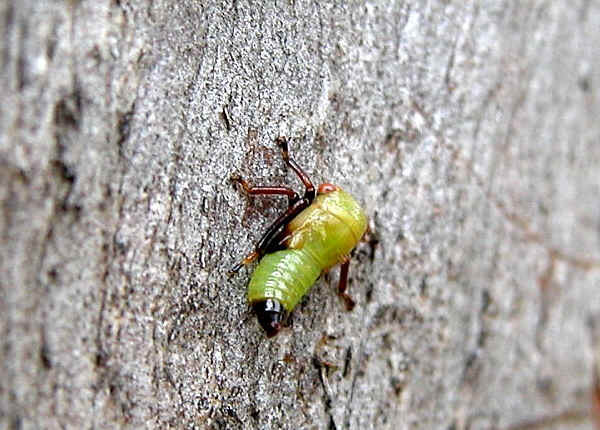 The Eurymelini are only found on eucalypts, so their common name Gum-treehoppers. They are brightly coloured or predominantly black. 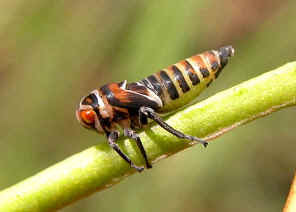 This Gumtree hopper is brown and violet in colour under sunlight. There were some white spots on its wings. They are common on young gum trees. More pictures and information can be found on this page. We listed three Eurymeloides species below. However, they look very similar and we may have mixed up their pictures in the following web pages. 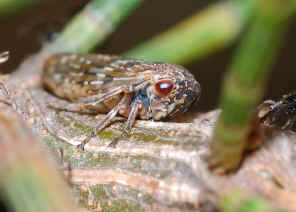 This Leafhopper was found during early summer in Karawatha Forest. A number of them were found on a small gum tree. They are all adults, black in colour with white lines on wings. Their eyes were orange in colour. More pictures and information please visit this page. 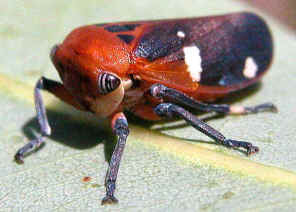 This species is common in Karawatha Forest. Adults were black in colour with white lines on wings. Their eyes were orange in colour. More pictures and information please visit this page. Pictures were taken in Karawatha Forest on Jun 2007. We found it once on a smooth bark gumtree trunk. Please check this page for more information. 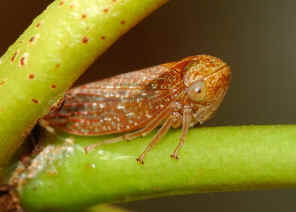 Ipoini treehoppers are relatively smaller in size. They are usually dull in colour with mottled patterns. 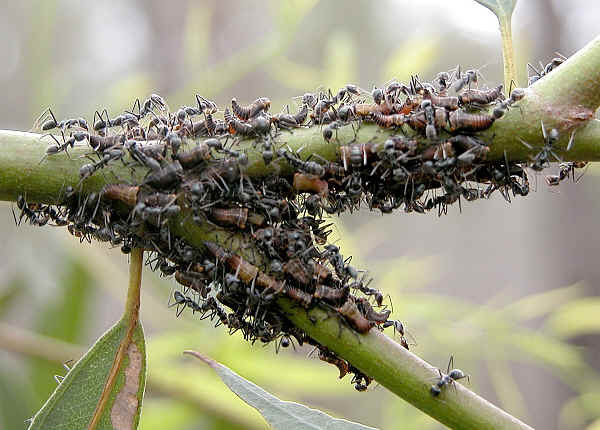 They mostly feed on eucalypts but some are on other plants. Pictures were taken in Karawatha Forest on Dec 2007. Check this page for more update information. Picture taken in Karawatha Forest during mid summer. Check this page for more update information. Picture were taken in Sunnybank near Bulimba Creek on Nov 2007. 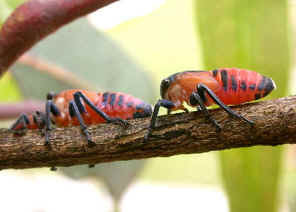 The adults and nymphs look like the Gum-treehopper of Eurymelinae. However, they were not found on eucalypts but on Casuarina She-oak. Check this page for more information. 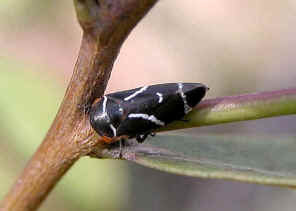 The treehoppers are black and white in colours. Its patterns make it well camouflaged among those attending ants. 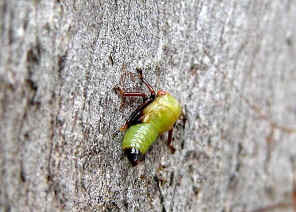 We found this group of treehoppers on Paperbark tree Melaleuca quinquenervia in Karawatha Forest Lagoon Track during Apr 2009. Please visit this page for more information. Pictures were taken in Karawatha Forest on early summer. Dr. Murray Fletcher sent us email and advised that this nymph looks like a member of the Eurymelinae. 1. Subfamily Eurymelinae, Tribe Eurymelini - Fletcher, M.J. (2009 and updates). 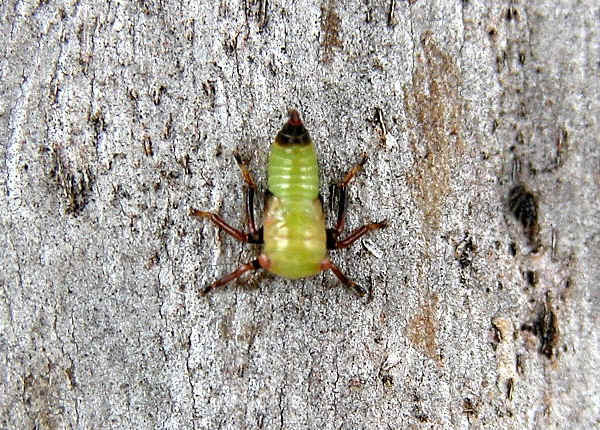 Identification keys and checklists for the leafhoppers, planthoppers and their relatives occurring in Australia and neighbouring areas (Hemiptera: Auchenorrhyncha). 2. Insects of Australia, CSIRO, Division of Entomology, Melbourne University Press, 2nd Edition 1991, pp 473. 3. Forest Health Sheet Leafhoppers - By Charlma Phillips, Forest Health Scientist, ForestrySA , Revised June 1992. Last updated: August 24, 2009.